Okay, so a lot of people know that if you’ve read my JoJo reviews, I did not like Trish as a character. I felt that she was just there, and never really stuck out to me, beyond the mission of protecting THE BOSS’ daughter. I mean, some episodes I wondered why she with the group, as she didn’t contribute anything. And then, after the train battle, it showed that Trish gets a Stand from seemingly nowhere, and I was upset at this, because I didn’t feel she deserved it. Throughout the series, I refused to change my stance on Trish, and the show did little to convince me otherwise. Until this latest arc, that is. After getting a plane to go to Sardinia, to find the Boss’ identity, there is a man who gets on the runway, who Mista kills effortlessly. When the plane gets in the air, Trish asks Buccellati about her father, recalling what her mother told her about THE BOSS back in his youth. Not long after, Giorno notices that there is an Enemy Stand in the mini-Fridge on the plane, but after confirming that it’s not a danger, Buccellati tosses it out of the plane. However, unbeknownst to everyone, it latches onto Giorno’s arm, Mista attacks it, and ultimately fails. Narancia tries to attack it, and fails. The stand latches onto Giorno, who has to cut off his other arm, taking him out of commission for the time being. By doing this, he saved Trish, who the Stand was going after. After all is said and done, and Buccellati tells Trish Giorno can’t fight anymore, she is left alone, with her thought about how Giorno sacrificed his arms to save her. Then, the Stand comes back for Trish, and would have gotten her, had Giorno’s brooch had not begun to form, forming his left hand. Realizing that Giorno can still be saved, she resolves to save his hand, but doesn’t know how to do so, when she doesn’t have a Stand. Realizing that the Stand attacks anything that moves, she tries to distract it by lowering the seats to the plane, and moving slowly towards Giorno’s brooch. After the Stand destroys the seat, Trish decides to do the same thing a second time, but it ends up backfiring, as a bottle shatters, and gets all over her boots. But as the Stand begins to crawl up her body, her boot softens like rubber, and her Stand, Spice Girl awakens. She explains that she’s been with her all the time, and that she’s had the power all this time, and she can save Giorno with her resolve. Trish wants to keep running away from the Stand, however, and runs into the closet, and the Stand catches her in the closet, and nearly attacks her, but Spice Girl softens a Clock in the closet, causing the Stand to attack that, instead. With the Stand distracted, Spice Girl takes a rod to it, and seemingly destroys it for all time. However, it seems that the Stand has gotten into the engine, and has grown. 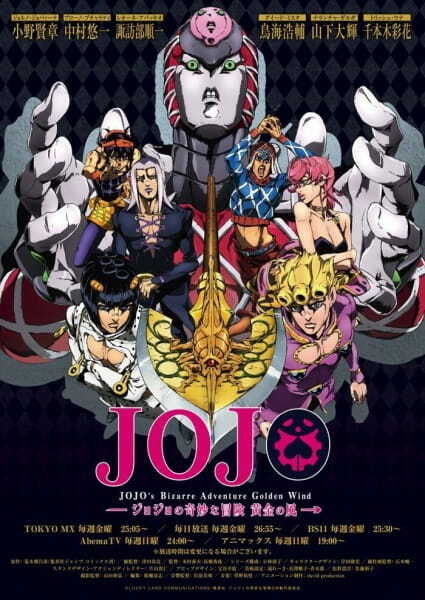 Buccellati warns Trish not to make a sudden move, because if she does, she could end up swallowed up by the Stand. He warns her to come slowly into the pilot’s cockpit, and instead, she rushes to Bruno, saying there’s no way they can avoid it, softening the door behind her, as well as the cockpit, and the separated the plane from the cockpit, just as it explodes. As Abbacchio notes that they can use this to their advantage, as the organization will think they died in the explosion. However, Buccellati notes that the Stand is on Abbacchio’s hair, and tries to stick onto himself, and unzip his arm, flinging into the ocean. Instead, Spice Girl rips it off, showing that she’s got Giorno’s brooch, showing he can heal everyone. This one arc, as well as this photo, shows how much Trish has grown in the last few episodes. Once a uptight, stuck-up girl who couldn’t bother to involve herself with the gang, to a girl who couldn’t fight, to someone who’s found a resolve of her own. I think that I’ve changed my stance on Trish. Go girl! Until next time, everyone, I hope you come back to my vault. Next Post Want to see part of my next article? Check out my Patreon and see!